Manufacturing companies are able to go about their production operations smoothly because of the presence of a production supervisor. 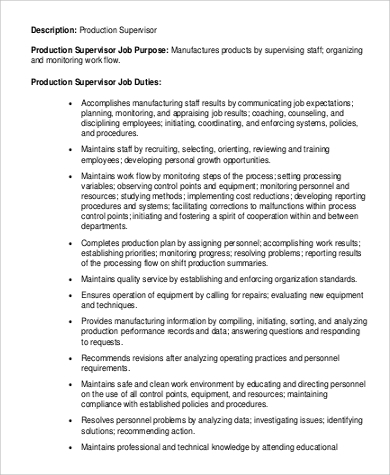 A production supervisor ensures that the production goals are met. He/she oversees the production staff and analyzes whether or not the production process is efficient or if it needs alteration. 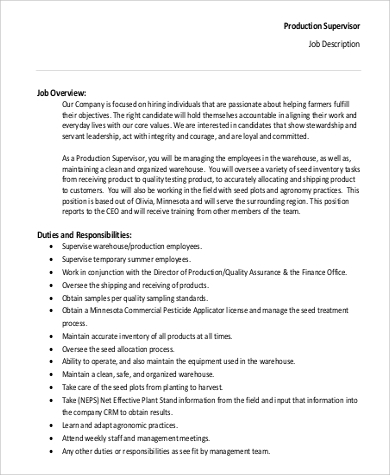 There are several important tasks that this position entails, and if you are currently looking to hire a production supervisor, then it is best that you refer to a standard production supervisor job description. 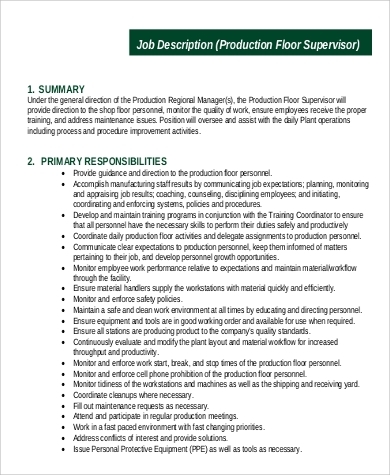 For your convenience, we have collected a variety of production supervisor Job Description Samples. Scroll down below and download these for free. Provide guidance and direction to the produciton personnels. 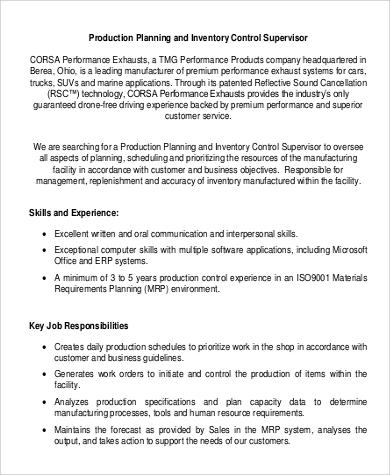 Accomplish manufacturing goals by communicating job expectations to production staff/team. 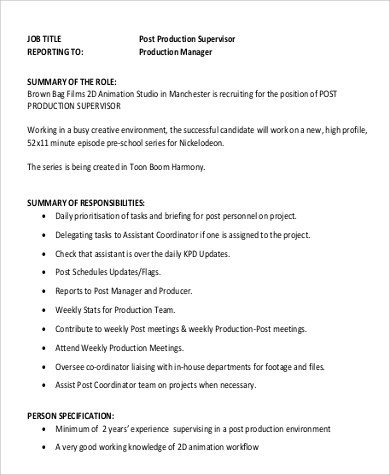 Provides coaching and mentoring for the production team. 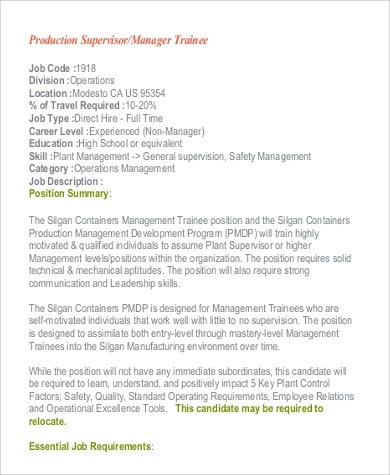 Develop and maintain training programs in conjunction with the training coordinator to ensure that all personnel have the necessary skills to perform their duties safely and productively. Monitor and enforce the rules on work schedule, breaks, and stop times of of the production personnel. Monitor and enforce cell phone prohibition of the production floor personnel. Ensures that the production staff will maintain the tidiness of the workstations and machines as well as the shipping and receiving yard. Coordinate cleanups with the cleaning staff (if applicable). Attend and participate in regular meetings with other managers or department heads and supervisors. Address inter-staff conflict and provide solutions. 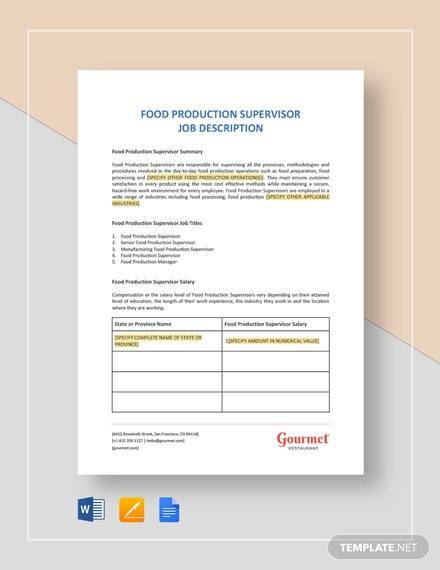 Communicate clear expectations to production personnel and keep them informed of matters pertaining to their job. 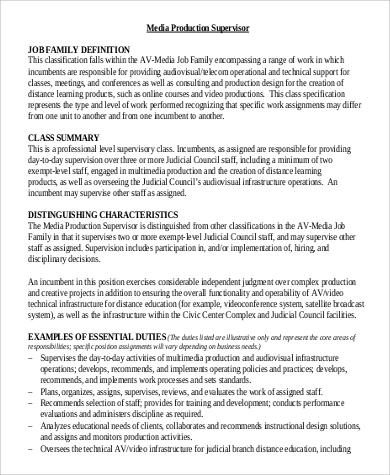 Oversees the hiring/recruitment of production staff. 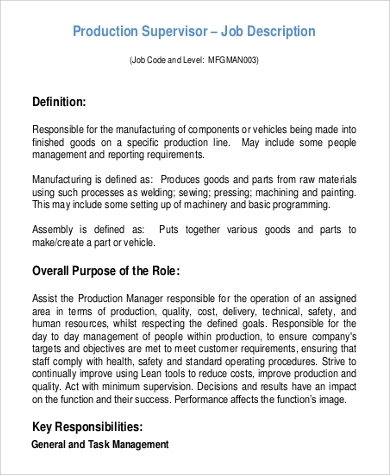 Prepares produciton plans and assign tasks to the staff. Impose fixed deadlines for the specific tasks assigned to produciton personnels and constantly ask them for updates regarding their tasks. Maintains the overall cleanliness of work environment. 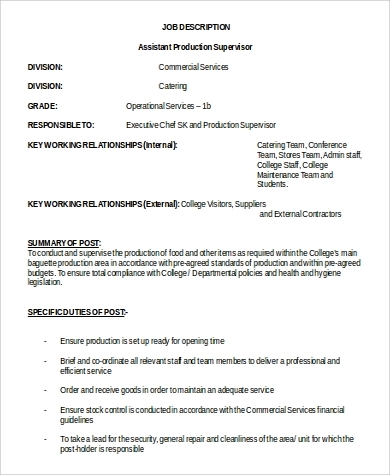 Attends to personnel’s questions regarding salaries, job expectations, and production operations-related inquiries. Ensure that production operations are within the budget allotted for it. Ensure that production is done in a timely manner. 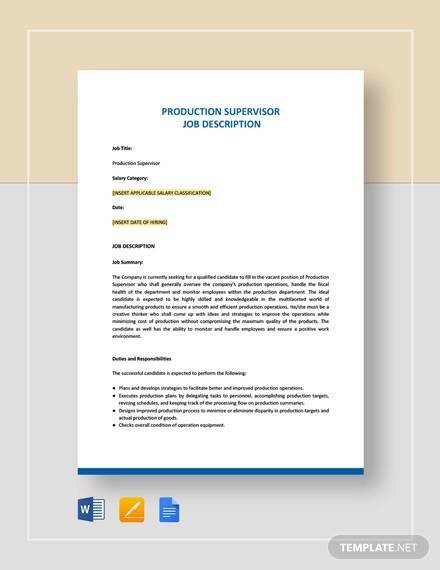 Speaking of supervisors, you can also check out our collection of Supervisor Job Description Samples. 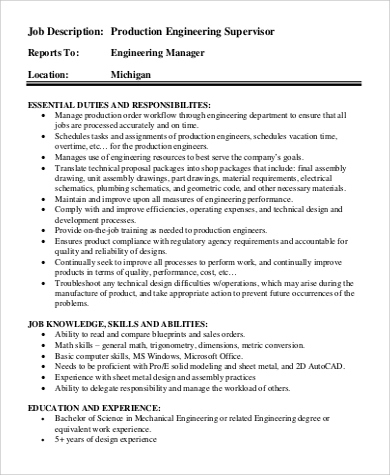 A degree in Management, Human Resource, or Engineering (if applicable) is preferable but not necessary. Strong leadership and organizational skills and capable of multitasking. Time conscious and capable of achieving production goals on time. Good interpersonal skills and capable of coordinating with managers and administrative officers and other department heads professionaly. Has a working knowledge of the industry that he/she is involved in. For example, if he/she is hired in a steel manufacturing company, he/she should have a solid foundation of engineering, metallurgy, or construction. Capable of using Microsoft Word and Microsoft Excel in sending memorandums, e-mailing administrators, and in keeping records of manufactured merchandise/goods.